SMS & Mobile solutions for Utilities. The current business climate in the utility sector is a challenging one for providers. For an industry that is facing pressures from customers demanding better services, numerous comparison websites and an increasing number of smaller less known suppliers, customers are constantly on the look for a better service. It is now essential for utility companies to consider how they communicate with their customers and how to provide the service that exceeds their customer's expectations. Use SMS to communicate more effectively with your customers, facilitate more accurate billing, effective trouble-shooting and engage with your customers on a two-way relationship that doesn’t rely on mobile apps. According to switcher.ie, 26% of those who took part in the survey were overcharged on at least one of their household bills. Improve billing accuracy by making it easier for customers to update you with their meter readings via SMS or a dedicated Mobile Journey. No one likes to wait on the end of the phone for an unspecified amount of time before they get through to someone. In fact, 25% of customers switch providers because they're tired of being kept on hold. Improve your customer's experience by providing them with the option to of self-serve and save time and money in your call centre. Find out what your customers are thinking, don’t wait until it’s too late to make improvements. SMS surveys can be sent seconds after speaking to your customers and have a greater response rate compared to email formats. Messaging solutions for energy suppliers. 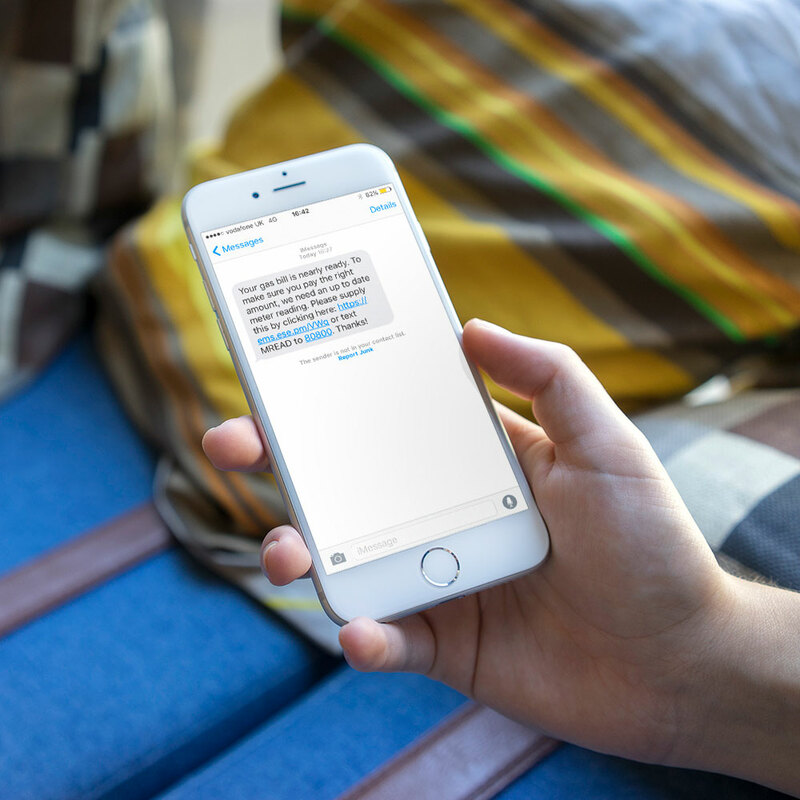 Request an up to date meter reading by prompting your customers with a text message that can be easily replied to. Improve billing accuracies by providing your customers with an easy text reply solution or with a dedicated Mobile Journey showing the details of their last reading and a form to fill out their current readings. Because customers are presented with simple and quick methods of providing their information and aren’t hindered or distracted by downloading and using a mobile application, they are more likely to complete the request. According to research, customers’ biggest problems that discouraged them from ringing their utility provider was the call charge and have to wait on hold for a long time. In a survey carried out by Nuance, 67% of respondents preferred self-service over speaking to a company representative. In an increasingly sensitive climate, proactively seeking feedback can give you an advantage over your competitors in the energy industry. Sending a follow-up survey with regards to recent contact can ensure that your business is meeting the level of customer experience you aspire to. Furthermore, an SMS survey has a highger rate of completion compared to other online services.